The iPhone 5s has a single-core score of 1400. 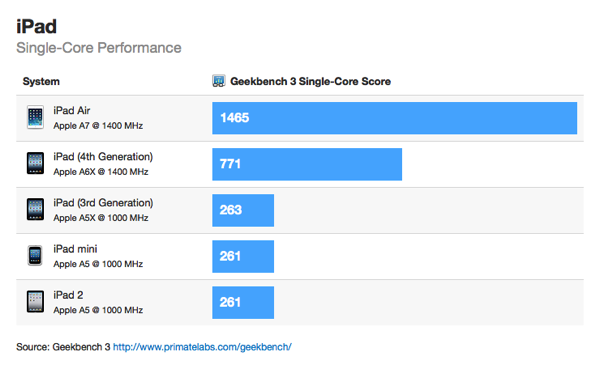 The iPhone 5s has a multi-core score of 2524. The iPad Air’s A7 processor is running at 1.4 GHz, 100 MHz faster than the iPhone 5s’ A7 processor. It’s not clear if the iPad Air processor runs at a higher speed thanks to a larger battery (providing more power), a larger chassis (providing better cooling), or some combination of the two. I expect the new iPad mini’s A7 processor will run at 1.4 GHz as well. In John Gruber’s review of the iPad Air, he similarly noted the same Geekbench results, with the iPad Air A7 running at 1.39 GHz versus the iPhone 5s A7 at $1.29 GHz. Taking a look at the iPad 4 versus the iPhone 5, the A6X chip in the former was clocked at 1.4 GHz, whereas the iPhone 5 and the A6 was clocked at 1.3 GHz, understandably. Should the A7 chip in the iPad Air actually be called the ‘A7X’?? At just $100 more, the iPad Air is over 5x faster than the $399 iPad 2. Poole questions which market Apple is targeting. We suspect this ‘lower end’ market could be schools or people who need a full-sized to do basic operations (i.e. iPad cash register), rather than run games, process video or do large tasks. You can check out a full roundup of initial iPad Air reviews here. 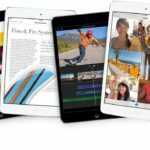 The iPad Air launches on November 1, with online sales expected to take place at 12:01AM PDT, while Apple retail stores will open at 8AM local time. Retina iPad Mini May Face Low Supply Due to Lack of Sharp LCD Panels?